Val de la Mare Reservoir is owned by Jersey Water and is kept open for the enjoyment of the general public. The reservoir was constructed in 1962 and is the second largest reservoir in Jersey (Queen’s Valley is the largest). The reservoir holds up to 938.7 megalitres of untreated water (enough to supply Jersey with water for approximately five weeks). Water feeds into the reservoir from its catchment area of 350 hectares (865 acres) which extends towards St Ouen’s Parish Hall in the North and La Grande Route de St Pierre in the East. Water is also pumped to Val de La Mare from the desalination plant when it is in operation. The reservoir has a natural wealth of flora and fauna and is home to many species of birds and wildlife. The reservoir has a floating reservoir mixer “ResMix” to improve and maintain water quality. It works by slowly mixing and circulating oxygen-rich water from the surface to the bottom of the reservoir. Installed in 2016 it is a very efficient and cost-effective system which helps to reduce and control algae and manganese levels in the untreated water. There are several walking routes (click here) around Val de la Mare Reservoir, the full circuit is 2.8miles (4.5km). The reservoir has a natural wealth of flora and fauna and is home to many species of birds and wildlife. Owls are also particularly encouraged at the reservoir – see if you can spot their nesting boxes. An arboretum has also been created at the reservoir. This garden devoted to trees provides a lush and safe environment for wildlife. We hope that you enjoy your walk around Val de la Mare Reservoir. For your own safety, the enjoyment of the reservoir by others and for hygiene reasons please follow the general information and guidelines below. Please be careful. 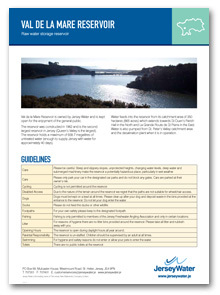 Steep and slippery slopes, unprotected heights, changing water levels, deep water and submerged machinery make the reservoir a potentially dangerous place. Please only park your car in the designated car parks and do not block any gates. Cars are parked at their owner’s risk. Cycling is not permitted around the reservoir. 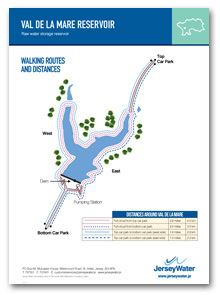 Due to the nature of the terrain around the reservoir we regret that the paths are not suitable for wheelchair access. Dogs must be kept on a lead at all times. Please clear up after your dog and deposit waste in the bin provided at the entrance to the reservoir. Do not let your dog enter the water. Please do not feed the ducks or other wildlife. For your own safety please keep to the designated footpath. For reasons of hygiene there are no litter bins provided around the reservoir. Please take all litter and rubbish away with you. The reservoir is open during daylight hours all year around. The reservoir is un-staffed. Children should be supervised by an adult at all times. For hygiene and safety reasons do not enter or allow your pets to enter the water. There is a portable toilet by the fishermans hut. Strava is free to use! Record your runs around our reservoirs, track your progress and join local challenges. Download the free Strava Run iPhone app and track your runs. Once you complete your run, your data will be sent automatically to Strava and plotted around our reservoirs. To learn more about Strava features visit strava.com.